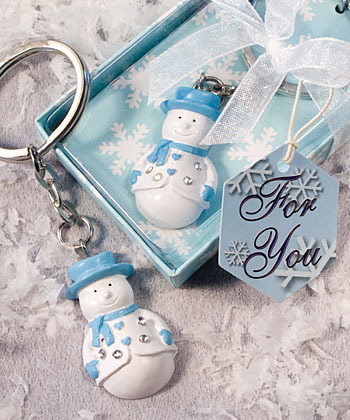 These delightful snowman key chains from our Snowman Sentiments Collection can play a key role in your winter event. With this cute character it’s easy to give your guests a wintery reminder of your special day. Each Snowman Sentiments Collection keychain favour measures 8cm x 3cm and has a classic snowman charm made of snow white poly resin with painted blue features and glistening clear rhinestone accents, attached to a metal ring and chain. Each snowman keychain comes attractively packaged in a Snowman Sentiments Collection signature box with a winter blue/snowflake design base and clear top, tied with a white organza bow and an attached snowflake design ‘For You’ tag.